Going sugar and grain free is tough! It seems the moment you make the decision, intense cravings for sugar kick in. In order for us to stick with this diet, I had to find some suitable substitutes to our favorite meals. Not just something 'fake', but something nourishing. Replacing empty calories with more nutrients and vitamins. One step closer to reversing tooth decay. Add a cup of fresh grass fed milk to this meal and you have a great breakfast! This recipe yields about 4-5 large pancakes or 8-10 small ones. Notice the amount of eggs, so don't let it fool you, they are filling! I would say it is a cross between a pancake and an omelette. You can play around with it and add fruit purees right into the batter. 1. Mix all ingredients (beat eggs very well) and let stand for a few minutes to let coconut flour absorb moisture. 2. Prepare a pan with oil ready for frying. I usually set it on medium-low until I am ready to fry. 3. Pour two to three tablespoons of batter for each pancake (or make smaller ones if you like). 5. Serve with yogurt, berries, and grass fed milk! 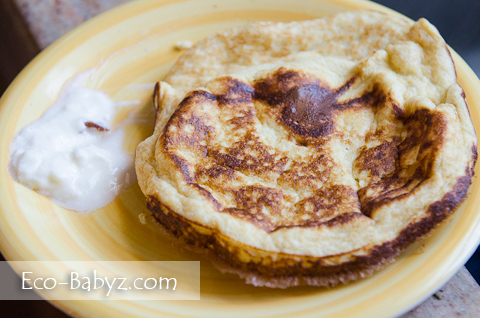 We started eating more eggs for breakfast and pancakes were never favorite in our home, however i did try these with coconut flour and they tasted more like and coconut omelet to me, only 3 members of our family liked it. They sure great alternative regular pancakes but for those picky eaters who use to traditional wheat pancakes the texture and taste is quite different. I did mention that "I would say it is a cross between a pancake and an omelette." :) I made it again today and perfected the recipe, so I think I'll add some changes when I get a chance. It was so much better with a little more yogurt, adding half a stick of butter and adding apple sauce! Wasn't as dry, very yummy, better than last time. I was too lazy to get a new photo though, just wanted to eat! I look forward to trying these! We've been experimenting with coconut flour alot and are always looking for a good breakfast recipe. I LOVE pancakes and can't wait to try this healthy alternative!! I absolutely LOVE pancakes but coconut flour pancakes?? OMG! !n I cant wait to try them!! It only costs $33! But ships from Canada, so that would be a lot probably. Still cheaper than comparable non-toxic pans. The pancakes come out AMAZING on it, never buns or sticks, even without coconut oil. Otherwise I wouldn't make them. Crepes come out awesome too, I was always afraid of them until now! hm...deff something I have to consider... Luda was telling me about some green path too they now sell at walmart but I never looked into it. Do you use wooden utensils on it or you use the plastic rubbery once or just regular spoons? Do you know what it is made of? Aluminum, etc? It's a ceramic/diamond coating over aluminum. It first appeared in Europe, they are always ahead with 'green' products. I only use wood and bamboo, but it does seem a lot more scratch resistant than another non-teflon Eco pan I own. OH, these look fantastic! I love baking with coconut flour. Do you think I can substitute coconut yogurt in place of the dairy yogurt? I see...ya shipping is 15 bucks!! craziness...hey i found another cool recipe for pancakes if you wanna try...instead of using coconut flour, try coconut butter (blend shreds in a blender for 15 mins and it turns into it)...so a cup of that, tablespoon of vanila, 2 sweet potatoes or 10 oz cooked squash...all blender with 10 eggs ...they came out really good and fluffy....not dry at all. I have wanted to try cocunut flour and I think this might just be the recipe to do it! I had never even heard of coconut flour til just now! Awesome! This recipe made great crepes I used keefer instead of yogurt. Tis recipe makes great crepes I just thinned the batter just a but with keefer...I have a crepe maker so it was easy. I have always wanted to try baking with coconut flour. These pancakes sound phenomenal! My daughter loves pancakes and I'm sure she would love this. I always love to incorporate coconut into my cooking so thank you for sharing this recipe. I am so in love with this.